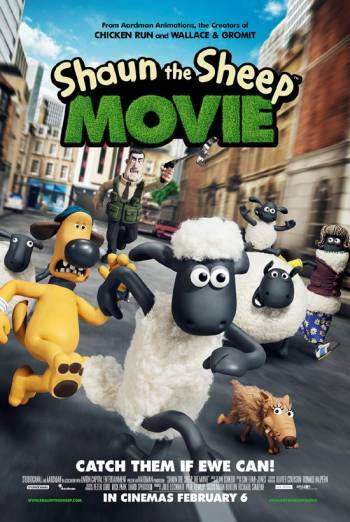 Summary SHAUN THE SHEEP MOVIE is an animated feature about a sheep whose plans to take a day off see him having an adventure in the Big City. SHAUN THE SHEEP THE MOVIE is an animated feature about a sheep whose plans to take a day off see him having an adventure in the Big City. Several sequences of mild slapstick, such as a bull charging at a man and sending him flying into the air and landing unscathed in a large pile of manure, and a big hole being made in a man's trousers after he is dragged along behind a speeding caravan. Mild comic threat includes a man holding a scythe being silhouetted against the moon so that he briefly looks like the Grim Reaper, and a sequence in which the farm animals are trapped inside a shed which a bad character is trying to push over a cliff. Further issues include rude humour, such as farting, a visual gag where it appears to onlookers that someone is urinating into a fountain (but we know this is not the case), and a lobster pinching a woman's buttock and her blaming a man standing nearby. When the farm animals engage in potentially dangerous behaviour, including running along rooftops, and one of them putting a fork in a microwave, the dangers are made obvious.